Summer remains a busy time here in Toronto and ‘technology’ continues to be the buzzword of activity. Techweek, which is a week-long technology festival for all those involved in the tech and innovation ecosystem, had its inaugural Toronto event a few weeks ago, from 25 – 29 July, 2016. It was a week that was packed with activities – from job fairs to pitching sessions and a one day conference event that touched on various topics such as big data, state of investment in Toronto, challenges faced by venture capitalists and aspects of the entrepreneurial journey. Basically, there was something for everyone. From its humble beginnings in Chicago in 2011, Techweek has now expanded to 8 cities in North America. It continues to draw budding entrepreneurs, technology visionaries and world-class CEOs to its event and is an interesting forum to learn, network and exchange ideas with like-minded individuals. 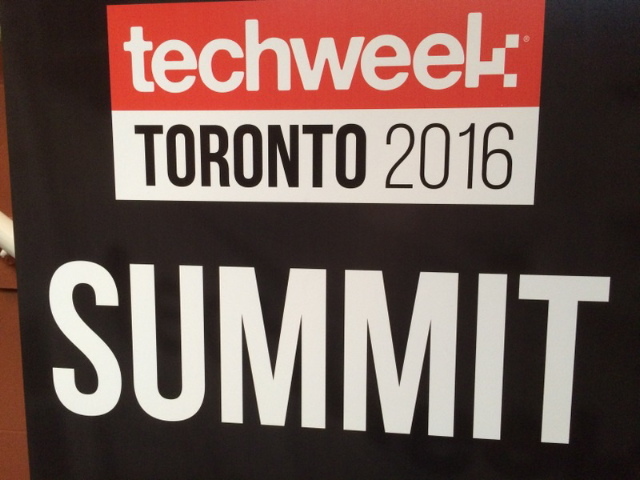 From that aspect, Techweek Toronto did not disappoint and I’m sure all the participants enjoyed the experience. So, what were the key takeaways from the Toronto event? Overall, I enjoyed the conference event the most – the topics were interesting and the list of speakers was pretty impressive. Here are my top 3 favorites from the speakers. Being an entrepreneur, like so much of life itself, is a journey. More often than not, it’s akin to a long distance marathon where you start with a dream but need to put in the hard work and to continuously keep at it before reaching the finishing line. Depending on your objectives, the end result could be either an initial funding from investors (which would prove that others believe in your idea) or the eventual exit strategy and buy-out of the business. This was certainly the experience that was shared by Michele Romanow and Rajen Ruparell – both successful entrepreneurs and both having co-founded companies that were eventually bought over by Groupon. What struck me most about them was their entrepreneurial spirit – they both started various business ventures whilst at University – and their persistence as well as sense of optimism. Despite encountering various set-backs in the initial years, they kept their focus, worked hard at being better than their competitors and eventually reached their desired goal. You never quite stop learning – and it’s important to have a ‘learning attitude’. Yoav Schwartz (CEO and Co-founder, UberFlip) spoke about how one is always learning different things at different stages of a company’s growth and the role of CEO changes with time. In the initial years, a CEO would be expected to be good at managing projects but in later years, the focus may change to being good at managing people instead. Allen Lau (CEO and Co-founder, Wattpad) shared with the audience that one of the key things he had to learn was ‘how to delegate’ – this was so that he could then free up his time to focus on other aspects of the business which really needed his attention. Whilst one can certainly learn from various experts such as professional advisors, it’s important to realize that at the end of the day, no one knows the business better than the entrepreneurs themselves. Thus, any advice given must be used in the context of what’s best for the business and it is the entrepreneur who has the ultimate responsibility to make that judgment call. This is especially critical in terms of funding for the new business. For example, whilst many start-ups are keen to obtain external funding as early on as possible, some entrepreneurs such as Markus Latzel (CEO and Co-founder, Palomino System Innovations Inc.) has relied mostly on bootstrapping as that was what his company needed and it also provided him with the flexibility to manage the business without being tied down to what investors may require. Many of us already know this but it’s always good to hear the experts say so as well! Sunil Sharma (Managing Partner, Extreme Venture Partners) spoke about the various attributes which Toronto (and Ontario as a whole) offers to budding entrepreneurs. It has a world-class innovation ecosystem comprising of top notch research universities, IT infrastructure, innovation hubs and labs as well as local talent. Also, we have seen the political will to make innovation one of the pillars of economic growth both from a federal and provincial perspective. More encouraging is the fact that the Canadian Venture Capital and Private Equity Association reported in May 2016 that venture capital investment in the first quarter of this year was $838 million, which was nearly double the amount recorded during the same quarter in 2015. A total of 118 venture deals were made in that quarter, with the majority of investments (i.e. about $486 million) being made in Ontario. Suffice to say that the innovation economy in Ontario continues to be an exciting space to be in right now and many of us are looking forward to seeing what new ideas our talented entrepreneurs have in store for us.